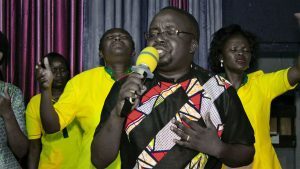 Sunday 30th September 2018 was a memorable day, the Echoes of Victory Choir organized a Worship evening and the Guest artist was Brian Lubega. There was a ministration of the Holy Ghost that was witnessed by the hundreds of worshippers that had gathered. Our Very own Bishop George and Pr Rose Oduch were in witness of the great move. The guest artist Mr Lubega shared his testimony and how the Lord has delivered him from anger in preparation for ministry and His service. The Congregation was entirely blessed and amazed by the move of the Spirit of God during the service.